Kazakhstan has long been as an engine of economic development and an example of stability and resistance to religious radicalization and terrorism in Central Asia. Moderate religious beliefs in the country and the nation’s distance from regional conflicts in Tajikistan and Afghanistan in the 1990s has shielded it from widespread religious radicalization. However, beginning in 2012, Kazakhstan witnessed a number of terrorist attacks that changed the government’s approach to radicalization and terrorism. According to government officials, law enforcement agencies prevented 30 terrorist attacks in Kazakhstan from 2014 to 2017. At the same time, there is increasing evidence of the involvement of Kazakh citizens (e.g. 500 people joined Daesh in Syria and Iraq) in terrorist organizations abroad. This brief article looks at radical religious organizations in Kazakhstan, the reasons behind their proliferation and the government’s response. 1. The majority of terrorist attacks in Kazakhstan targeted on law enforcement officials and security agencies. The aim of the attacks was probably to demoralize and intimidate these agencies and highlight their weaknesses. In May and June 2011, Kazakhstan experienced several attacks which were presumed to be terrorist despite evidence. In Aktobe a young man detonated a bomb at the entrance of the National Security Committee’s (KNB) local representative office killing himself and injuring three people. Later in the same month, a car parked near the KNB’s office in Astana blew up killing two men inside the car. In both cases, the official line was that the attackers used religion as a cover rather than an act of terrorism. On June 30, 2011, two police officers were shot in the Aktobe province which led to a massive operation by law enforcement agencies. 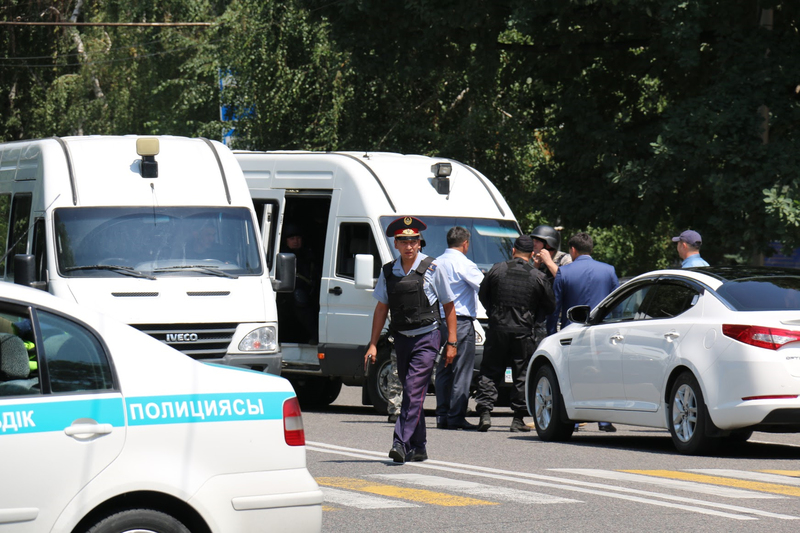 At the beginning of July, the special forces of the Ministry of Internal Affairs and KNB conducted an operation to catch the possible culprits of the attacks in Aktobe and Astana in which two security staffers were killed. In October 2011, there were two explosions near buildings of the regional government and the general prosecutor’s local office in Atyrau. Five members of security forces and two civilians were killed as a result of fire and blast in Taraz in Southern Kazakhstan. In the span of one hour, the terrorist attacked the local security services office and several civilian buildings. In June 2016, a group of religious extremists attacked a gun shop and later a National Guard military compound in Aktobe. In clashes between law enforcement forces and terrorists, 18 terrorists and eight innocent people were killed, including three police officers. In July, Ruslan Kulekbaev, a violent religious extremist, attacked a police station and the local representative office of KNB in Almaty killing six people. Three police officers wounded in the attacks later died in the hospital. 2. There are linkages between terrorist groups in Kazakhstan and their inspirers in North Caucasus and Afghanistan. The main radical religious group who conducted attacks in Kazakhstan in 2011 and claimed responsibility for them was Jund al-Khilafah (Soldiers of the Caliphate). This group’s followers also conducted attacks in eastern Afghanistan, Pakistan’s tribal areas and North Caucasus. Most of the terrorist attacks in Kazakhstan occurred in the west and the south of the country. Western Kazakhstan is near North Caucasus which is a terrorist hotspot. Radical religious groups in Chechnya and Dagestan influenced their counterparts in neighboring Kazakh provinces. The perpetrators of the attacks in Aktobe and Almaty in 2016 were also allegedly connected with the radical Salafist movement. 1. Economic inequality, unemployment and fall out from the financial crisis. Both Aktobe and Atyrau are industrial centers of oil and gas extraction, which is the main income source in the country. After the world financial crisis and the fall of oil prices in 2008 Kazakhstan faced a number of problems like several currency devaluations, budget cuts, and increased unemployment and social tension. Kazakhstan also ranks high in the world index for corruption. Out of 180 countries in the world it ranked 122 in the Corruption Perception Index 2017”, and 80% of Kazakh youth indicated corruption as the most crucial problem (OECD, 2017a). At the same time, a substantial part of the population in the southern and oil extracting western provinces of Kazakhstan, have low incomes. In order to overcome these problems, the government of Kazakhstan is implementing a national development strategy dubbed “Kazakhstan 2050” and a state program to boost infrastructure development “Nurly Zhol” (Bright Path) for 2015-2019. 2. Lack of quality religious education. After gaining independence more people began to study and profess the religion. By 2013, 3,200 places of worship were opened, making Kazakhstan the country with the most mosques in Central Asia. The rapid proliferation of mosques made it difficult to appoint qualified heads (imams) to promote the moderate Hanafi religious school, which was officially supported by Astana. According to the Spiritual Association of Muslims of Kazakhstan, which is responsible for coordinating the activities of mosques and their staffing in the country, in October 2016 among the 3,600 imams, only 15% had a higher education and 22% had secondary education and 63% only took short-term preparatory courses. Therefore, the problem of religious education of both imams and ordinary people professing religion became a central issue for the government of Kazakhstan. Astana adopted a special program targeting these issues soon after the above-mentioned terrorist acts. Despite many years of economic development and stability, Kazakhstan has been facing an increase in religious radicalization in several provinces in recent years. The negative implications of the financial crisis and the slump in oil prices sharpened existing socio-economic problems. Inadequate religious policies of the government also contributed to the rise in radicalization. The growing number of terrorist attacks between 2011 and 2016 shook the Kazakh government which later tried to implement a new policy to combat the phenomenon.